While I've been on several cruises in the past, this was the first cruise that I had chosen to book an inside stateroom to save some money. 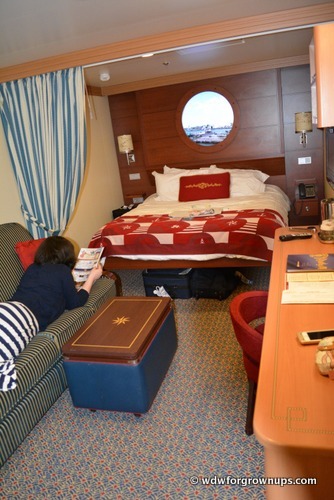 These inside nooks are are usually the lowest category of stateroom because of a smaller size and the lack of a view. This makes booking an inside stateroom the most economical way to travel on a cruise ship. An inside cabin is exactly what it sounds like: it's a stateroom on the inside of the ship, and as such offers no natural light by window or porthole. 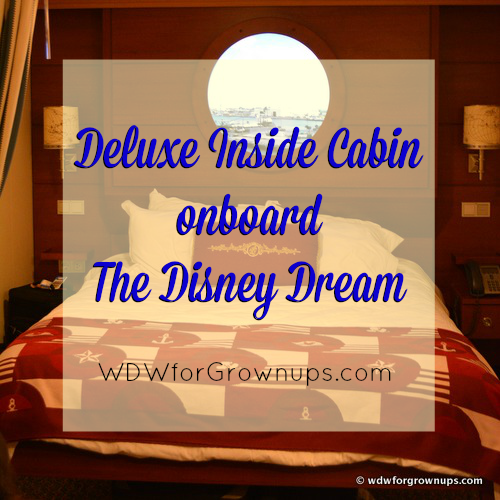 However don't let those two points fool you, because on the Disney Cruise Line the inside staterooms are just as plush as those with an ocean view. Deluxe Inside Staterooms on both the Disney Dream and the Disney Fantasy are 204 sq. ft. of well thought out space. The cabin features the same nautical decor and amenities that are found in all of the DCL Cabins, with luxury triple sheeted linens and blonde wood accents. A queen-size bed, a single convertible sofa that folds down to slightly smaller than a standard twin is in each room, and an upper berth pull-down bed is available in some. My 22 year old daughter slept on the sofa bed, and at 5'8" was fairly comfortable. Her only complaint about taking the sofa bed was that her ankles rested on the wooden piece at the end of the sofa. She thought that guests not quite as tall as she is wouldn't have an issue with it. The queen size bed is elevated to allow for you to unpack and stash your luggage beneath the bed and out of the way during the cruise. We had brought along quite a bit of clothing (including formals for dinner) and found that the closets provided ample hanging storage for our clothing while we sailed. Also in the closet was a personal safe large enough to store a laptop, or other small electronics, and documents. The multi-purpose desk space was laid out to be used as a wet bar (with a small beverage cooler below), with a 22" LCD flatscreen television on a swivel arm above it. The desk was stocked with many documents and brochures explaining the daily cruise operations, and was home to an array of charging ports and light switches. 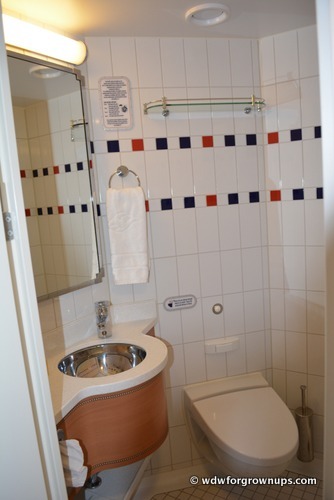 The Deluxe Inside Stateroom offers the convenience of a split bathroom. The split bath offers a shower, sink, and mirror in one room, and a second room with a toilet, sink, and mirror. This allows for multiple people to get ready at the same time, and is a big bonus in cruise travel. 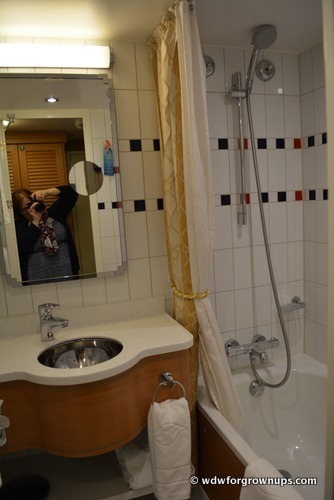 Even with the extra space, cruise bathrooms are tiny. If you prefer a little luxury to your primping, consider a length of stay rainforest pass at Senses Spa, and make use of the gorgeous showers and locker rooms there. If you enjoy sleeping in a very dark room for sleeping, an inside cabin is ideal for you. With no natural light seeping in, these rooms are pitch black once the lights and the magic porthole are turned off. However, it also makes it very easy to lose track of time if you pop down for an afternoon nap, and if you're not careful you could sleep the day away. So - what is this Magic Porthole? On the Disney Dream & the Disney Fantasy the Imagineers created a virtual window to the sea by adding a video monitor above the bed that looks just like a porthole. This monitor runs a 24-hour live view from a camera off the aft of the ship, and allows you a real time look at the sea. 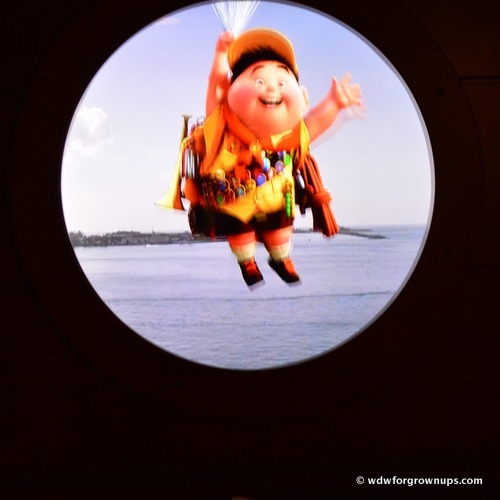 It's a fabulous addition to the inside cabins, but you know Disney wouldn't just leave it at that, these magical port holes get occasional visits from some of your favorite Disney animated characters. 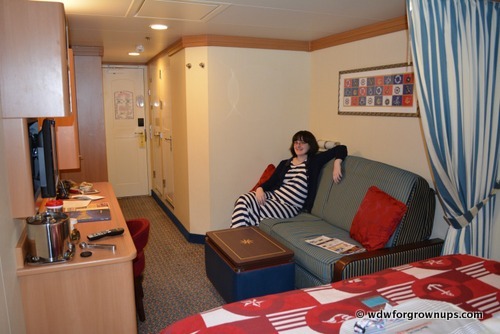 I stayed in room 6501, a Deluxe Inside Stateroom, onboard the Disney Dream, which is just about as far forward on the ship as you can get. I enjoyed the location of this room, and managed never to get lost while staying there. The closest elevators would let us right out at the Quiet Cove adults only pool area, which I enjoyed being near. Not having a private balcony on this trip, Quiet Cove became my "go to" space to lounge around and stare out at the sea. Overall I thought this was a fine space for two adults that don't mind being in close quarters with each other. I would be very cautious however adding anyone other than a small toddler as a third (or even fourth) person into this cabin. My daughter and I found that only one of us could really be moving around the room at a time without tripping over things. Though I will always prefer a room with a balcony, I would happily take another Disney Cruise on the inside. 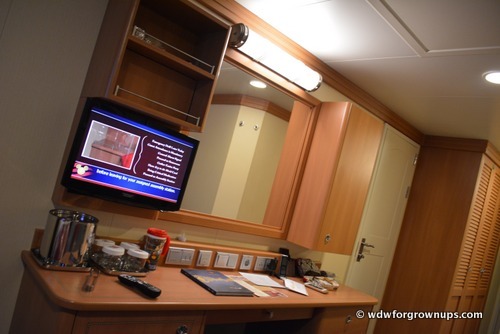 Have you stayed in an Inside Stateroom on the Disney Cruise Line? What did you think? Leave a comment and share your experiences with us! About the magic porthole - how close does it seem to a real porthole? Does it make you feel as if you have a view outside, or does it feel like a TV screen and nothing more? And can you leave it on all night if you want? I could easily travel without a veranda, but I'm not sure I could handle not having a porthole.